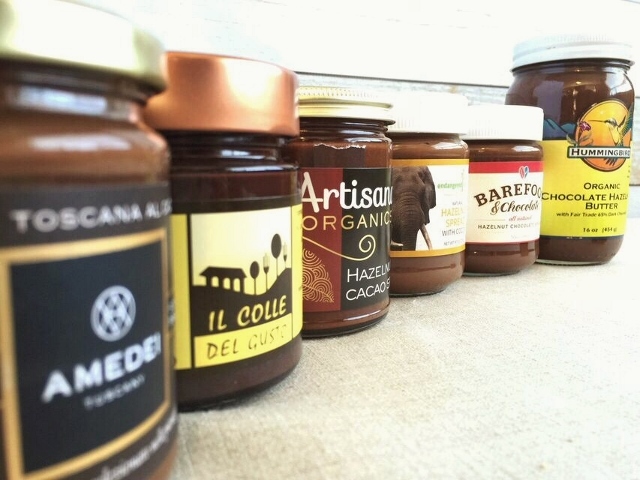 I’ve been writing about Nutella and its copycats since this blog began 3 years ago. Apparently there’s a lot to say about chocolate-hazelnut spreads because it’s spawned 3 of my most popular posts. (You can find 1, 2, and 3 here if you’re into historical nutrition non-fiction.) Today’s post makes number 4. It seems like there are more imitators than ever before on the shelves, which may explain why I have 6 new jars of dark brown goodness to share since the last nutty post in February 2014. With all the details about cost, calories, and consistency from the multitude of products I’ve reviewed before, I thought it was about time to pull all pertinents and such from the past Nutella blogs into one handy chart for comparison. That’s right. Nutella and 15 of its closest friends are getting a side-by-side nutrition review. 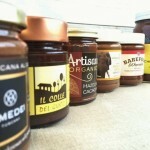 Amedei Crema Toscana Al Cacao Hazelnut and Chocolate Spread: Did you know Nutella got its start in Italy? Since this product was from Tuscany, I had high hopes. Turns out it’s super-smooth but with no predominant flavor that stands above the rest. It’s just OK.
Il Colle Del Gusto Granellona Brut Coarse Hazelnut and Extra Virgin Olive Oil Spread: Deep and dark, this one is more chocolatey and fudgey in flavor than hazelnutty, which is probably why I liked it so well. It was the softest spread of the bunch, almost runny and with an olive oil sheen, which contrasted nicely with the chunks of actual hazelnuts. (I think our “chunky” nut butter is their “coarse” nut butter, hence the name.) Weirdly, though, along with the nuts came some nut matter that was neither nut nor shell that was unpleasant to bite into…but not unpleasant enough for me to stop eating. And the ingredients were unique. You know how adding a little coffee brings out the chocolate flavor in a brownie or cake recipe? Well, the fresh-pressed flavor of the olive oil seemed to heighten the hazelnut and chocolate flavors. Insert smiley face emoji. 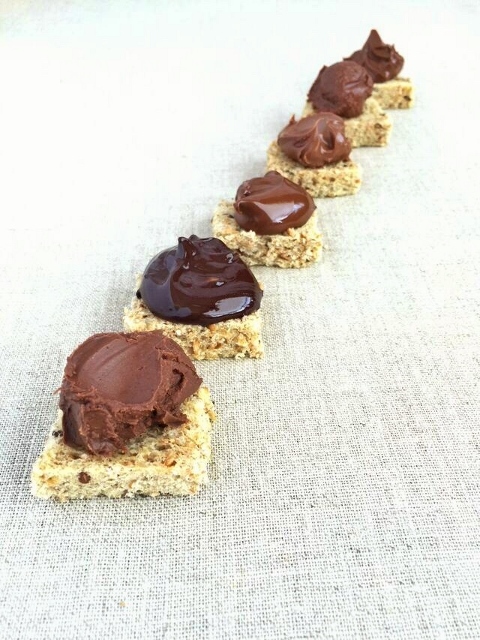 Artisana Organics Hazelnut Cacao Spread: The consistency and texture were very similar to the widely available “natural Nutella”, Justin’s Chocolate Hazelnut Butter Blend. It’s definitely not super smooth like Ferrero’s original, but instead has a little coarseness and it’s definitely not as sweet either (essentially in the same way that Adam’s Natural Peanut Butter is different from Jif). Overall, it simply fell flat on my taste buds. Barefoot and Chocolate All Natural Hazelnut Chocolate Spread: I liked this one. It was shiny and incredibly smooth, just like the real thing. The flavor was almost fruity like a fresh, raw hazelnut. (I guess that would make it nutty?) In any case: fantastic. 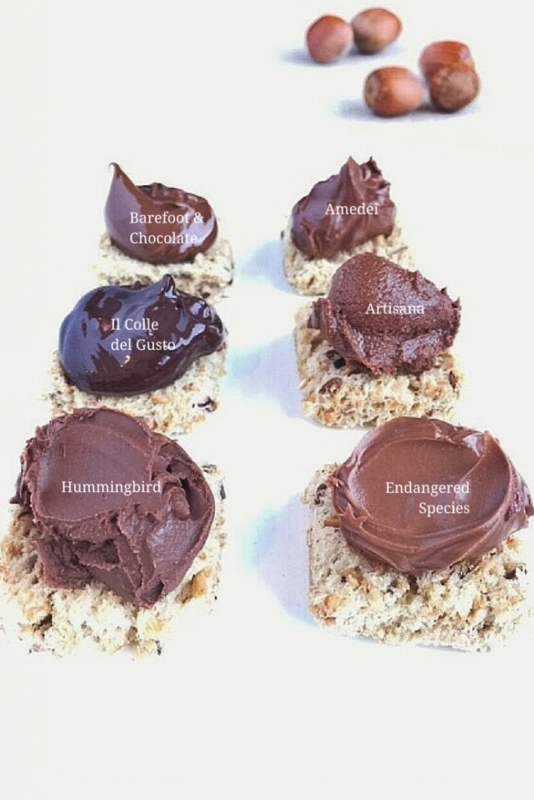 Hummingbird Organic Chocolate Hazelnut Butter: This stuff is unadulterated and all-natural. It’s so thick it’s more like chocolate ganache; they are not messing around. 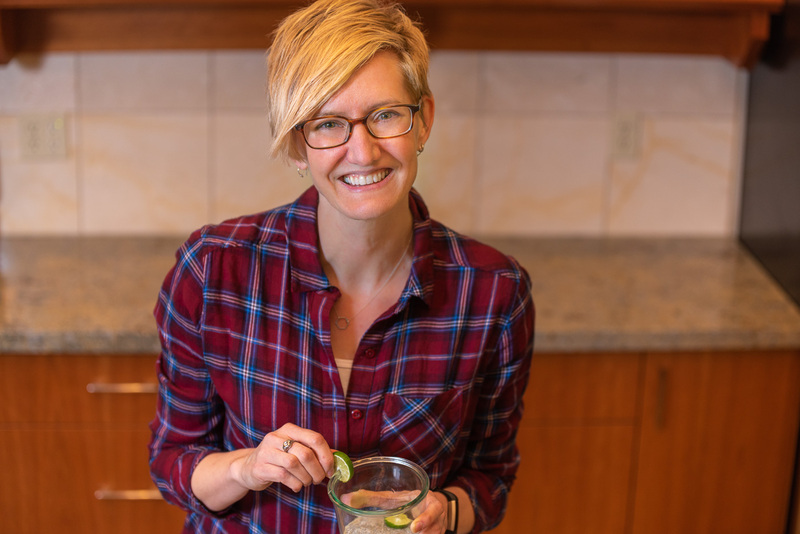 It’s simple and not as sweet which is great from a nutrition, whole-foods perspective. Unfortunately, from a taste perspective I felt like it needed more flavors or richness going on. The lasting taste was just sort of bland. Here’s how they look nutritionally compared to the other brands I’ve tested in the past. The delicious data is broken up into two tables for easier viewing, and you can use the scroll bar to move to the right and see each and every listing. Palm Oil X X Just lists vegetable fat, so can't say for sure. The spreads are in order from cheapest to most expensive. Depending on who’s selling the stuff, shipping can be a significant additional cost which is not included in the prices listed here. For many brands, you might get lucky and find them at a local store and the majority are available on Amazon. Certainly, buying larger containers of a product would reduce the cost per ounce. For example, Safeway had two larger jars of Nutella which reduced the price to $0.33 or $0.27/ounce. But this isn’t an option for most of the spreads I looked at which generally just come in one size. I removed those brands that were included in previous posts if I couldn’t easily track them down to purchase. I also kicked one out because it had huckleberries in it; just didn’t seem like a true substitute. You may have heard that Nutella and its palm oil have been in the news lately, and it’s not so favorable. (France wants you to boycott it but Greenpeace says that may not be the best solution.) Some of the spreads containing palm oil that I reviewed noted that theirs was organic, orangutan-friendly, certified sustainable, or from a pro-worker and pro-cooperative farm. Nutrition information isn’t included on the jars of either of the Italian brands, Amedei and Il Colle Del Gusto, so I have nothing to share with you…despite trying to reach the companies by email. I did get a lovely response from someone at Manicaretti Italian Food Imports (who sells the magical Il Colle spread) noting that “the producer is very small and the product does not include a nutritional label.” Those darn Italians. No concern for nutrition labels, yet they’re still healthier than we are. Go figure. I purchased my Artisana from Amazon on May 21 of this year, but as of today it’s listed as unavailable. From the looks of things on the Artisana website, there might be a recipe change in the works. There appears to be a name change with the Jem product since I originally reviewed it. Their website currently shows Jem Hazelnut Raw Cacao but my jar from a couple of years ago calls it Jem Specialty Nut Butter Chocolate Hazelnut Spread. Either way, the ingredients are the same. You might notice that the product with the most calories and the most protein is Nut-Tritious. I’d also recommend taking a gander at the variation in sugar content across all the jars. Pretty noticeable differences when you’re comparing side-by-side. After many serious tastings and careful thought, my favorites in terms of flavor and nutrition are listed below. Not surprisingly, all five start with hazelnuts as their first ingredient. Even though I have favorites, I still say chocolate-hazelnut spread is a decadent treat that probably shouldn’t become a daily habit. If you’re going to indulge, try to find one with a reasonable nutrition profile and a taste that makes you happy. And of course, the calories, fat, sugar, etc. all come down to portion control. I keep to 2 tablespoons or less. This Nutella stuff just seems to keep on giving: one post a year for the life of this blog. Guess chances are pretty good we’ll revisit this tasty topic in 2016 as well. Until then, here’s what’s on my wish list: Rawmio Original Hazelnut Chocolate Butter, Loacker Hazelnut Spread, Maisie Jane’s Chocolate Hazelnut Butter, and Cinnamon Daddy Mactella. After all this serious research, the sweet brown stuff has gone and inspired me. Coming soon on the blog: my very own recipe for homemade Nutella. Guess I should add myself to the growing list of imitators. Do you enjoy any of these delicious spreads from the dark side? If so, do you stick with the true original or venture out with one of the imitators? Hi Christine. I love their curried lentil dip but haven’t tried out the chocolate ones yet. I just put it on my list for the next time I find myself at Whole Foods. Thanks for the tip!